Set on the glamorous Cote d’Azure, the Nice Carnival (Carnaval de Nice) is one of the largest and most famous carnivals in the world. Many of the world’s top film directors, such as Vadim, Truffaut, Cocteau, Hitchcock and Woody Allen, have contributed to the city’s fame by filming there in the renowned Victorine Studios, established in 1919. So, it is appropriate that the theme for the 2019 event is the King of Cinema. Nice is a city immortalised by Hitchcock’s 1955 classic To Catch a Thief and Cary Grant’s rampage through the stunning Nice Flower Market. 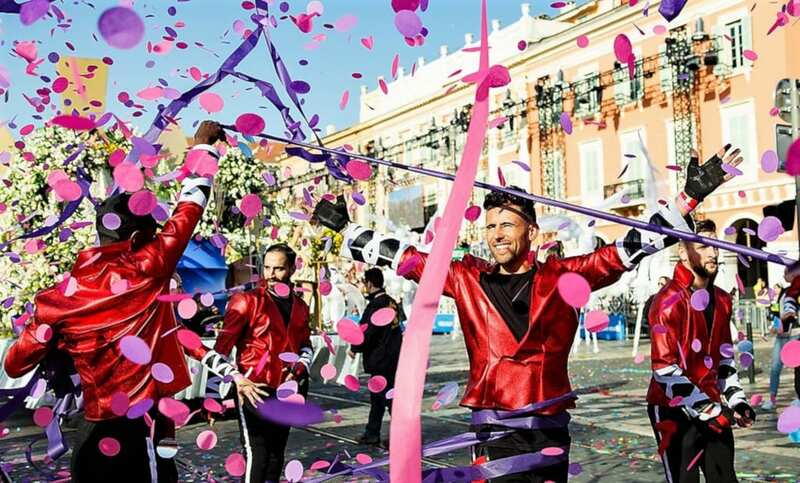 Flower battles still occur on the Promenade des Anglais as part of the carnival’s celebrations, with about 100,000 flowers thrown from the floats. Nice is now a city for the many not the few, with many budget airlines flying to its international airport, making the carnival accessible to thousands of visitors. Held in February and March, tourists from less temperate climes are tempted to seek out the blue skies and the warmer weather of the South of France. The carnival has six parades with up to 17 floats and more than 1,000 musicians and dancers. The festival has a long and illustrious history. It is reported that in 1294 Charles Anjou, the Count of Provence, commented on the joyous days of carnival that he had spent in Nice, which in all probability makes it the first recorded carnival in history. While you are in the South of France, why not try out the Fête du Citron Menton (Lemon Festival) 2019. In 1873, a Committee of Festivities was set up by Andriot Saetone, a citizen of Nice, and in 23 February, 1873 the first Carnival took place with floats and other structures used for the parade. On 14 February, 1882 a rag and straw puppet called Triboulet, based on an archetypal 15th century court jester created in Victor Hugo’s banned novel Fantine was introduced as an active part of the festival. Triboulet was enthroned in the ‘char royal’ and paraded through the city centre and environs. 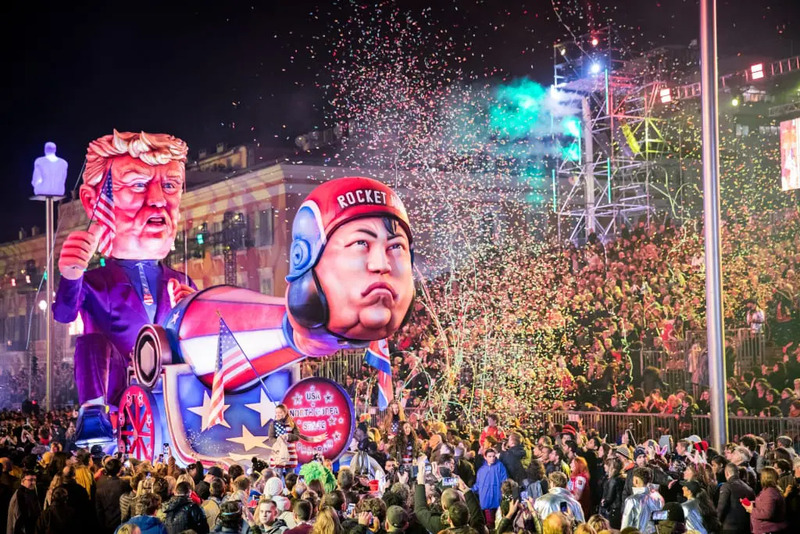 The festival did not take place during the first and second world wars, nor in the Gulf War in 1991, but the modern carnival as we know it was created by Alexis Mossa and his son Gustav Adolf in 1971. They set up grotesque and very unusual models for the floats. Don’t miss this amazing festival set in such idyllic surroundings with such a romantic past. 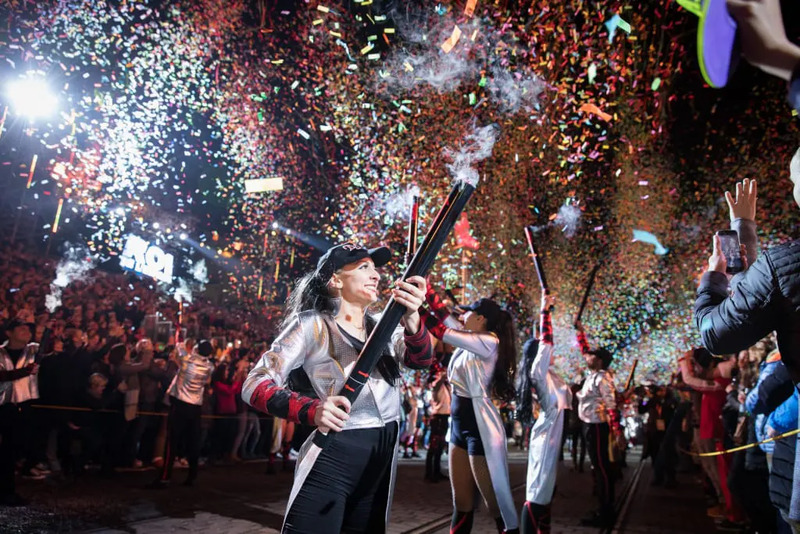 The 2019 Carnival will start with a flower parade, with costumed models on the floats throwing thousands of flowers to the crowds, on 16 February at 2:30pm. This is followed by a Carnival Parade of Lights at 9pm in the Place Massena which will have a large screen showing all of the illuminated floats. The Parada Nissarda (Carnival Parade) will take place on 24 February at 2.30pm. Flower Parades will also take place on 20, 23, 27 February and 2 March, with Parade of Lights on 19, 23, 26 and 2 March. The Carnival concludes with the Burning of the King at 9pm on 2 March at the Parade of Lights in Place Massesna. The Nice Carnival will start on 16 February and conclude on 2 March. Nice Airport has a number of budget flights from around Europe, including Ryanair and EasyJet. If you are looking for accommodation in Nice during the Carnival, please try our Hotel Booking Portal. 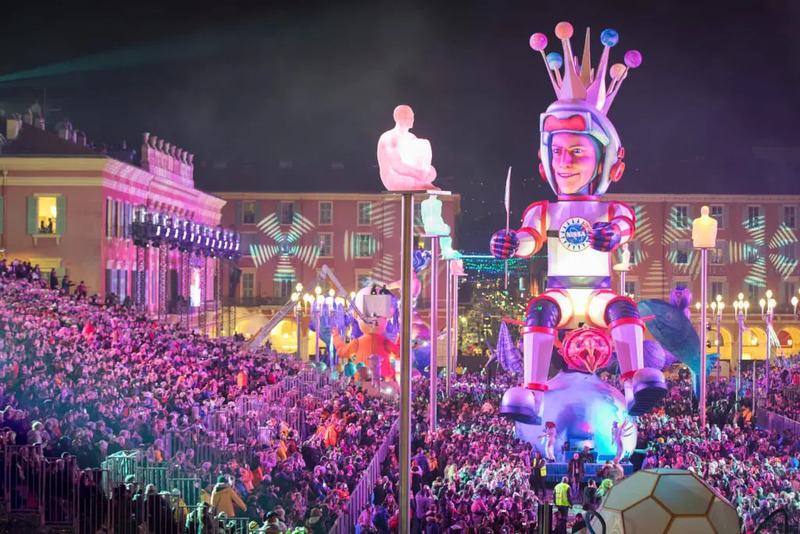 For further information on the Carnival, click here, and for ideas on what to do while in Nice, click here.